When I was a teenager, I read Stephen King's book The Stand. It begins with the near-obliteration of humankind by a lethal virus. This was weirdly alluring stuff for a angsty teenage daydreamer. What would you do if the world ended? What would be your fate? I figured I'd make it a couple of months on canned food before succumbing to some sort of brutal antibiotic-resistant bacterial infection. These days, I find one of the most interesting aspects of post-apocalyptic fiction is it requires an apocalypse. This often means a horrific scenario inspired by science: astronomy (impact event, e.g. Lucifer's Hammer), microbiology (pandemic, e.g. Oryx and Crake / blight, e.g. Interstellar), cybernetics (people-hating intelligent machines, e.g. The Matrix), climate science (climate change, e.g. Cat's Cradle), physics (fallout/nuclear winter from nuclear war, e.g. Fallout), and the list goes on. Evidently it's easy for artists to get caught up with taking what we know about the world around us and twisting it to envision destruction. For today's post, I'd like to explore the science of a particular end of the world scenario in which (1) people are selectively wiped out or at least made an endangered species, (2) there is minimal damage to the planet during the wiping, and (3) all other organisms survive unscathed. So basically The Stand, but from the perspective of nature. The question I'm interested in is: how would the numerous organisms we share the world with set about breaking down the infrastructure we've constructed for ourselves? How would the Earth undo our great works? Let's start with wood. Many organisms are good at making holes in trees in order to digest them for food and/or construct homes in which they can hide out and reproduce. This is a transferable skill, as tree-damaging organisms also break down human-built wooden structures: fence posts, utility poles, railroad ties, buildings (frames, flooring, stairs, roofing), playgrounds, etc. Take the wood poles used to distribute phone and power lines, for example. 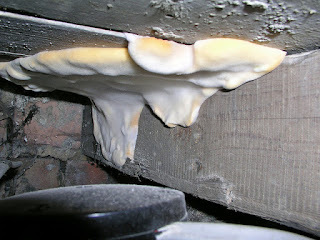 They can be damaged by fungi, insects (e.g. 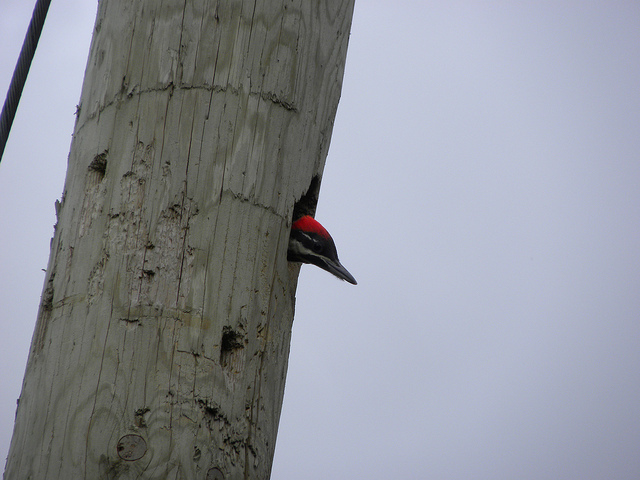 termites and certain ants and beetles), woodpeckers, and, for poles stuck in the ocean, wood-boring animals (e.g. shipworms). As a pole is hollowed out, its structural integrity decreases until it falls over. Since utility poles are connected in series via the lines they carry, the collapse of a single pole can bring down many of its neighbours. 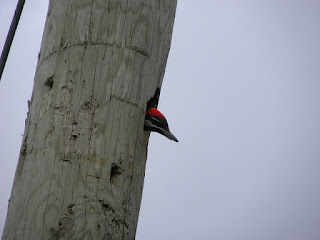 I've heard there are sections of power lines where they've had to replace all of the wood poles with ones made out of a composite material since woodpeckers were continually pecking holes in them. Woodpeckers tend to drill way more holes than they need for roosting or nesting, and these holes facilitate further damage. Utility poles are often treated with poisons (e.g. creosote or chromated copper arsenate) intended to prevent wood-eating organisms from doing their thing, but this usually only covers the surface of the pole. If a woodpecker makes a hole (preservatives don't seem to repel them), other organisms can use it to bypass the poison and cause decay. Many fungi are capable of damaging the wooden parts of buildings. They'll grow wherever there's wood (food), water, oxygen, and a favourable temperature (at least above freezing). Two of the most destructive are the brown-rot (cellulose-eating) fungi Meruliporia incrassata and Serpula lacrymans. They pump out hydrogen peroxide, which soaks through wood and weakens it substantially, causing it to crumble and ultimately fail to support whatever it was holding up. M. incrassata and S. lacrymans are particularly problematic (or successful, depending on how you're looking at it) because they can transport water and nutrients over long distances. This means they can do annoying things like grow throughout a connected wooden structure even if only one part of it is damp, or invade homes by growing through mortar and concrete. Mushrooms, the sometimes-delicious spore-releasing structures made by certain fungi, can punch holes in roads and other asphalt surfaces. Presumably, this action would leave behind holes (as the mushrooms die back, being the ephemeral structures they are) through which plants could grow and further break apart the asphalt. 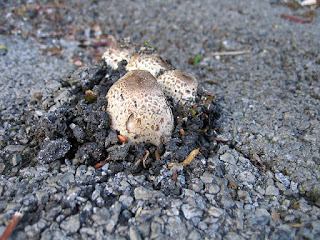 Fungi known to send up their mushrooms through asphalt include Agaricus bitorquis (the appropriately named pavement mushroom) Amanita muscaria (fly agaric), Phallus impudicus (common stinkhorn), Pisolithus tinctorius (, , ) and Podaxis pistallaris (false shaggy mane). Tree roots can slowly yet surely damage pretty much anything we place in their path. 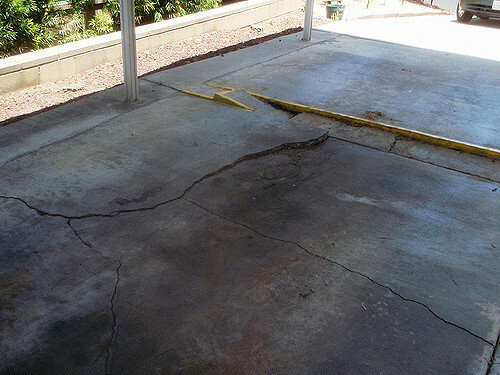 Sewer pipes, storm water drains, buried water and gas lines, building foundations, sidewalks, patios, streets, parking lots, walls, and swimming pools can be cracked, broken, heaved upwards, and/or shifted about by a growing root. There are two mechanisms by which this damage occurs. First, as roots grow outwards and increase in size, they lift things up or push them to the side. Second, as roots beneath a building pull moisture out of the soil, the soil shrinks and the building settles. Rodents, insects, and birds are known to chew on power and communications cables buried in the ground, suspended in the air, or running along the sides of buildings. Underwater telecommunications cables, of which there are millions of kilometers worth crisscrossing the world's oceans, are occasionally bitten by sharks. In Australia, underground cables can be severed by the guillotine-like roots of a parasitic plant. 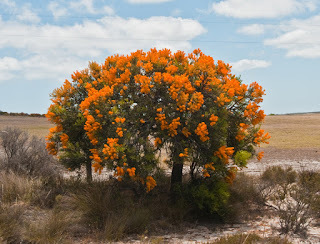 The Western Australian Christmas tree (Nuytsia floribunda) grows in Western Australia and tends to bloom around Christmas (which is in the summer down under). 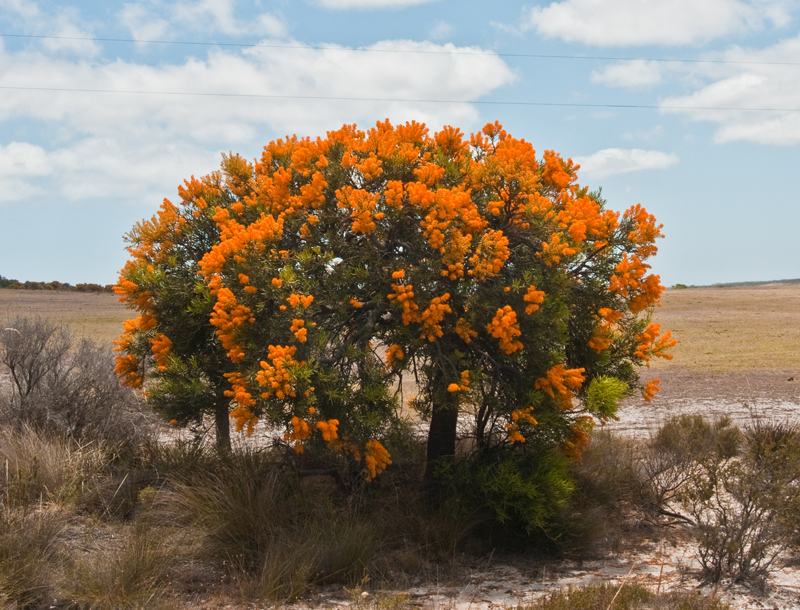 Like mistletoe, N. floribunda is a hemiparasite. This means while it can do a bit of photosynthesis, it obtains water and nutrients by hooking its roots up to those of nearby plants and withdrawing what it needs. When it encounters a nice juicy root beneath the ground, N. floribunda uses its specialized roots (haustoria) to grow a collar around it (Figure 3A). Two folds of tissue extend around opposite sides of the host root and fuse together to completely encircle it. This collar contains a sickle-like cutting device (Figure 3D) which is sharp enough to cut tissue paper. The collar thickens and constricts the host root until the cutting device cuts right through it (Figure 3E). After severing the root, N. floribunda constructs a disc of tissue to sit up against the cut and plug into it in order to drain water and nutrients. It seeks out roots to feast on by detecting certain plant-produced compounds such as ethylene gas. These same compounds can be given off by plastic-covered cables, causing the plant to attack and damage them in search of a meal. If you leave a non-living surface, be it stone, glass, or metal, exposed to the great outdoors for long enough, chances are a lichen will show up. If there's a bit of soil to be had in a crack or hole somewhere, a plant may appear. Plants and lichens damage buildings and monuments made of stone, brick, or concrete by producing corrosive organic acids (e.g. oxalic acid) and punching (and then expanding) holes with their roots/thalli. Materials containing calcium carbonate, such as limestone, are particularly susceptible to acid damage. 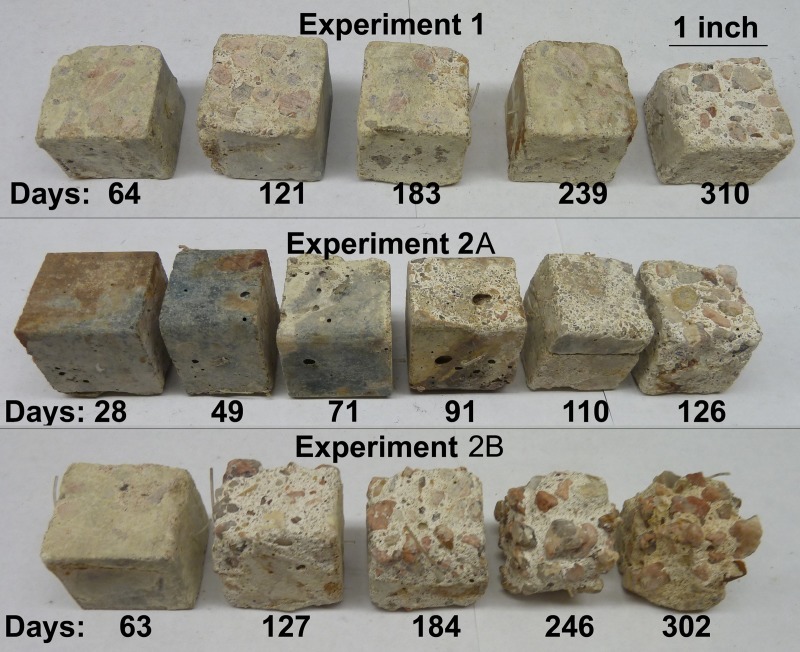 Corrosive acids are also produced by certain bacteria living on stones/bricks/concrete. Ammonia-oxidizing bacteria bring about the production of nitric acid using ammonia from lichens, algae, or bird crap. Sulfur-oxidizing bacteria produce sulfuric acid from hydrogen sulfide and other partially reduced forms of sulfur. This acid will convert hard marble into soft and crumbly calcium sulfate. 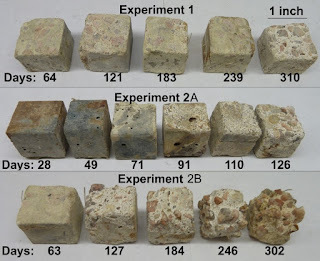 Sulfur-oxidizing bacteria are a major cause of concrete deterioration in sewers systems and sewage treatment plants, as there's lots of poop and thus sulfur for the bacteria to convert to sulfuric acid. Hydrogen sulfide, produced by sulfur-reducing bacteria, can also contribute to corrosion. Bacteria also corrode pipes and storage tanks made out of metal. These are found in water distribution systems, oil pipelines, and most industrial facilities (e.g. pulp and paper, food processing, oil refining, etc.). As they grow on the insides of metal pipes and tanks, bacteria can alter the local environment in such a way as to cause or speed up corrosion. This can involve changing the pH or producing corrosive compounds like hydrogen sulfide and iron phosphide. Datla SV, Pandey MD. 2006. Estimation of life expectancy of wood poles in electrical distribution networks. Structural Safety 28(3):304-319. Day RW. 1991. Damage of structures due to tree roots. Journal of Performance of Constructed Facilities 5(3):200-207. Hopper SD. 2010. 660. Nuytsia floribunda. Curtis's Botanical Magazine 26(4):333-368. Lisci M, Monte M, Pacini E. 2003. Lichens and higher plants on stone: A review. International Biodeterioration & Biodegradation 51(1):1-17. Marra LJ. 1989. Sharkbite on the SL submarine lightwave cable system: History, causes, and resolution. IEEE Journal of Oceanic Engineering 14(3):230-237. Niksic M, Hadzic I, Glisic M. 2004. Is Phallus impudicus a mycological giant? Mycologist 18(1):21-22.